Soul of the World by David Mealing. Orbit, 2017. Paperback. 656 pages. It seems that 2017 has been a ridiculously fantastic year for fantasy so far, and David Mealing has only helped continue that trend with his debut fantasy novel Soul of the World, the first in a planned trilogy. I was incredibly interested in this book when I came across it as an upcoming release and knew that I would have to pick it up -- and it has easily turned out to be one of my favorite fantasy books of the year. If you want a brief synopsis of the book, I suggest visiting the Goodreads page or another bookstore page, as I'm not sure I could do this book justice, so let's just jump into the review! 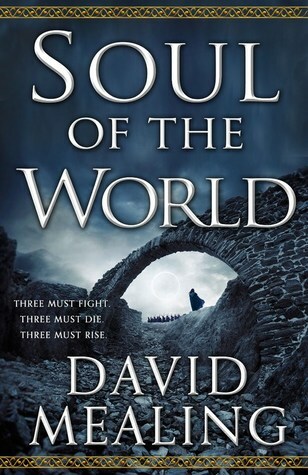 Soul of the World has a strong start, but it still took me a little while to fully feel as if I had my footing. This is complex world that does require you to pay attention, but it absolutely pays off. Once I started getting into the thick of things, I was suddenly sucked into this world without even realizing it and my initial hesitations vanished. The magic system is unique and really well-developed. I'm usually pretty impressed with the inventive magic systems that fantasy authors develop, but this one in particular blew me away. There was something about it that just felt very fresh and creative to me moreso than other fantasy books I've read lately. I almost got some video game-esque vibes due to how the magic was specifically used and how much magic a character had available to them in their stores. It's a very visual sort of magic system where I felt like I could really see how the magic was used. Simply the notion of having a certain supply or ability to use certain threads of magic was particularly intriguing to me. I was also really impressed with how Mealing revealed the magic and how it was revealed and expanded gradually throughout the story, feeding bits of information at a time until I finally felt like I had a good grasp on it. This can really bother me in some books, but Mealing did a great job of feeding it to the reader. In addition, as someone who can be confused by complex fantasy worlds, I can easily be put off by being dropped into a world with no idea anything that's going on. However, Mealing did something special and although he introduced us to this world by first dropping us into it, he made it work really well. He teased just enough information and intrigue to keep me going, and by the time I was almost halfway through I realized that I had just completely lost myself in this world the lives of each character. The characters were fantastic. I was a bit wary of Erris at first because the beginning chapters were so heavily military focused, but the military workings - and Erris herself - slowly fleshed out and I grew to really enjoy her chapters. I loved learning about the workings of the magic system throughout her POV as well as how she took on her role as a military officer. She is a strong, commanding force and I really look forward to seeing more from her in the next book. Sarine was probably my most enjoyed POV, simply because I had a great time reading about her own journey - and also her companion Zi's! (You'll like Zi, trust me.) Sarine is sneaky, astute, and ready to take on pretty much anything. I appreciated her journey into better understanding her powers and who she is, and I also look forward to seeing what else she learns to do with her powers since she grew up without any proper training or understanding of what she could do. Arak'Jur also provided an intriguing POV, and probably took me the longest to get through because of the complexity of his chapters. The names were fairly confusing at first and I felt worried that I would be confused for the entire book... but eventually it all fell into place and I was hooked before I knew it. There is a lot to take in in Arak'Jur's chapters, but I really enjoyed his character and that's what made me want to keep going. I liked reading from an older male perspective, especially since he was a guardian of his tribe, which added an interesting dynamic to his character. I enjoyed reading the customs and cultures of his tribe and surrounding tribes, and I do hope to see more about these developed in the next book because I think that there is a lot of potential in there. I should also note the character of Reyne d'Agarre, a man of mystery. My feelings of positivity and negativity towards his character were always fluctuating and I am left without knowing how to feel about him - I can't wait to see what happens with this figure. One last note: There are also multiple 'interludes' which, I'll admit, I groaned a little when I saw them at first because we all know what those can be like in dense fantasy books--but they were fantastic. They actually added valuable information the story that I enjoyed reading.. Do you know how rare that is? I was thrilled! Overall, I've given Soul of the World five stars. This is easily one of the best debuts (fantasy or not!) that I've read this year, and I can't wait to read more from both this trilogy and from Mealing himself!